This last week, I experienced sub-zero temperatures for the first time in my life. Highs in the single digits; lows in the minus-teens. It was so cold that when I'd get out of the car and take a first breath I'd cough a bit. I don't usually mind winter, but last week I found myself pining for warmer weather. 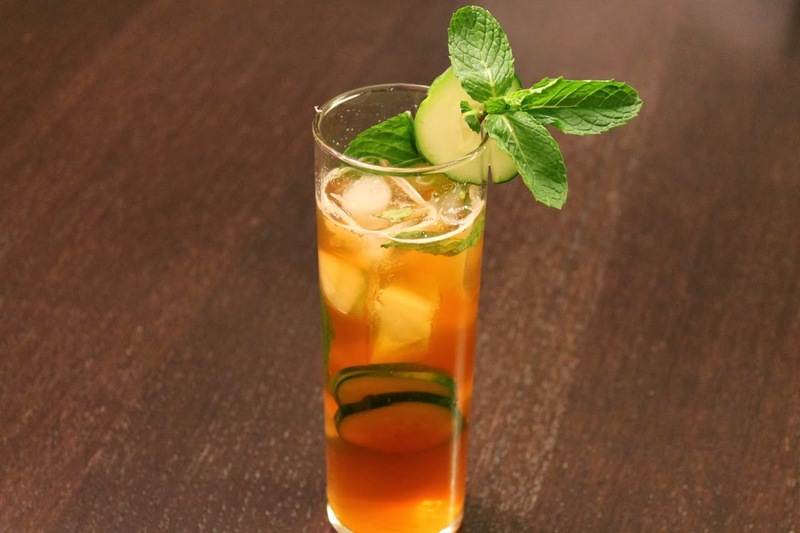 Enter the Pimm's Cup, a British summer staple that for many conjures fond memories of garden parties and polo matches, while for others represents a cocktail disaster of excess sugar and garnish. Yet, the Pimm's Cup isn't beyond salvation. As covered by Elizabeth Gunnison Dunn in The Wall Street Journal last summer, the drink is experiencing a renaissance in Britain among bartenders experimenting with the "summer cup" formula with fresh fruit and herbal flavors as well as different spirits. Traditionally, Pimm's Cup consists of Pimm's No. 1 Cup, a fruity/spicy gin-based liqueur, and lemonade with a range of herbal, fruit and vegetable garnishes. Where Americans may go wrong with Pimm's Cup is not realizing (or forgetting) that "lemonade" means something different in Britain than it does in the U.S. Here, lemonade is a sweet-tart drink made with fresh lemon juice and lots of sugar. Abroad, lemonade is carbonated like a soda. Something like 7-Up may come close, but it's still not quite right. To reduce the sugary sweetness of the drink, I hit on the idea of using Italian lemon soda, Limonata, which has a nice lemon flavor without the heavy hand in the sugar bowl. I also kept the garnish simple: just the traditional cucumber slices and a few fresh mint leaves. So why am I making a summer cocktail when it's freezing cold outside? I needed it as a reference point for something else I'm concocting. Stay tuned. Fill a collins glass with ice layered with cucumber slices and mint leaves. Add Pimm's and lemon soda and stir to combine. Serve garnished with a cumber wheel and mint sprig. I'll confess: I wasn't wild about the Pimm's Cup, but I veyr much love how this post ends with a cliffhanger!